Two last performances next week: Saturday 26 and Sunday 27 of March! "Coma Ca Va" is entering another performance with success thanks to our fans! 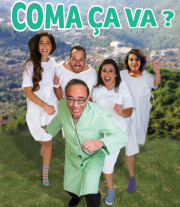 Sami Khayat, Sabine Khayath, Jad Saad, Nay Riachi and Natalee Kattoura.